Eleven deaths in police firing at Naxalbari gave it an immortal stature in the history of political movement in India. Its name got spread far and wide giving rise to ideologies linked to popular revolution. But there is another similar story of martyrdom in the same region- untold; another monument of martyrs lying in neglect and negation in a corner of a tea garden. 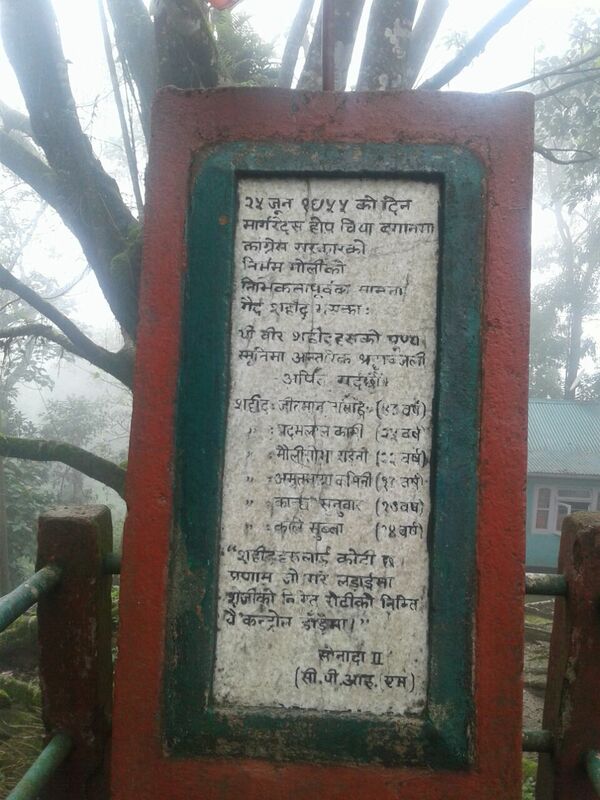 The Tea loving Bengali ‘vodrolok’ who are used to visit the hills during summer holidays, who are often seen romanticizing ‘spring thunder over India ’, never felt any urge to even visit this history. The historic movement at Margaret’s hope garden in 1955 saw death of six workers in police firing while a Bengali doctor played a pivotal role in the movement which ushered in a dramatic change in the labour rights in the garden as well as direction of communist movement in West Bengal. DrAvaniRanjanTalapatra was a member of communist party of India, he was better known as ‘the poor man’s doctor’. This was a time when if any worker failed to reach the garden before the siren call, he/she would have been subjected to a thorough thrashing by the manager and his men. A small instance would be quite reflective of the level of oppression the workers used to face those days. One day HarkamanDewan, a worker, wanted to see the reading of the weighing machine as he wanted to check how much leaves he had plucked. Because the day’s wage of a worker used to be fixed depending on the amount of leaves collected by him/her. But for doing this simple act, the manager punched him on his face. Even there was a custom called ‘Hattabahar’ which meant that however small may be a worker’s fault, if the management wants, it could retrench anyone and the jobless fellow would never found any job in any garden, either in the hills or in the Duars. Despite the country being free for nearly a decade, the garden workers were still under a colonial rule. Workers were not allowed to wear shoes, wristwatch, full-pants or use an umbrella as those were exclusive only to the officers. During rain workers had to use handmade umbrella made of leaves attached to a bamboo stick, which was called ‘Ghum’. Working among bushes in half pants would eventually cause abrasion and injury. It was DrTalapatrawho used to prepare an iodine water reservoir where workers used to wash their feet after work to protect themselvesfrom infection. In evenings, the doctor would visit the workers in their shantytowns as being a doctor he did not raised any suspicion of the garden management. But he didn’t only give medical treatment to the workers, but also tried to imbibe the sense of rights among the workers. It eventually resulted in garnering unity among the wretched workers, unity against the oppression of the garden authority. This was like assembling a pile of dynamite, waiting for the little touch of a burning matchstick. tea garden workers of those tea gardens which were closed in 1952-53 should be provided with some grants, etc. It’s to be noted that these demands were already made in the election manifesto of RatanLal Brahmin in 1946. Ratanlal Brahmin, DrTalapatra and SushilChatterjee, another communist leader from Nadia who was deputed in Darjeeling made notable contribution despite fierce opposition from the authority. DrTalapatraorganizedworkers ‘meeting at his own home under the pretext of his son’s tonsor ceremony(hair cutting/shaving ceremony of a child at the age of three). To remain undetected by the garden authority, meetings used to be held in forests at night. Inspite of all these precautions, the doctor got caught and was terminated from his service along with his compounder and bungalow workers. The garden authority specified the reason of his termination: ‘to safeguard the garden from communist ideology’. But it was already too late; workers were already conscious of their rights and were ready to fight for it.AfterTalapatra was thrown out of the garden, the movement and the organization started to be led by the local organizers who used to work with him. At ground level, the movement was spearheaded by HarilalSardar along with SamaneySardar, RamjitRai, SailaTamang etc. Purnay Subba while recollecting about Sardarsaid: “HarilalSardar was from DokanDara, Hangkhim (Rai) in race and had influence over the workers of entire Lower division of the Margaret‟s Hope Tea Estate. During those days he used to ride horse and wore full pants and shoes which were prohibited for the workers. People used to greet and wish him with respect. He was hated by the managers and the staffs who were in favour of the managers as he was the leader of the Union. During those days everybody used to fear managers but he was the only one who can talk to the managers face to face.”Nanda Hangkhim, an eminent Nepali laureate and dramatist was the third son of HarilalSardar, who had written a drama and made a movie based on the incident of 1955 (UnaisSauPachpanSaal) where he had shown the role of his father in the movement and the incident of movement in a dramatic way. A plantation labourstrike was going to be organised under the leadership of CPI and Gorkha league. A meeting was called at the labour department to resolve the issue. But the state government started arresting the union leaders. Many activists went underground. On 25th June, 1955 workers from nearby Munda, Ringtong, Balasan, Maharani gardens started assembling at Margaret’s hope. Suddenly word got spread that in the nearby garden of Belter, police is trying to force the workers to join work. The workers started marching towards Belter. At this moment, insisted by Mr. Auckland, the manager of Margaret’s hope garden, police started seamlessly firing upon the marching workers. This caused death of six, among them a young lady, MoulisovaRai was pregnant. Consequently hundreds of workers were arrested. Famous Nepalese poet Agam Singh Giri was also arrested for being sympathetic to the workers’cause. But these atrocities resulted in mass furor, not only among the garden workers from all over the hills and dooars, but also among the general people in Darjeeling, Kurseong who hit the streets in protest. Under this tremendous public pressure, finally on 27th June, the state Government agreed to all of the demands including payment of due bonus, implementation of maternity leave and scrapping of the hattabahar system. Decades have gone by till then, much water has flown through Teesta between 1955 and 2018, but till today tea garden workers are continued to be deprived of their righteous demands and wages, they still get a meager 150/- . The ‘party of the oppressed’ that showed dreams to the workers, had long back forsaken them as soon as it rose to power. Kushlal Subba, a retired tea garden worker and an active participant of the movement, now in his 80s was walking down the memory lanes; his passion, though now shaded under several ages of dust, but still powerfully radiant. While proudly recollecting that glorious history, he suddenly murmured nearly like a soliloquythat JyotiBasu, the record making ‘communist’ ex-chief minister of Bengal, during his ‘struggle days’ once came to visit the garden after the workers’ victory. As the city-dweller comrade leader could not walk in the hills, Subba with many others carried him on their back to all of the meeting places, yet Basu did near nothing for the tea plantation workers when he rose to power later. Yet the 1955 movement is a watershed in the life and rights of tea plantation workers. That was the first time they tasted victory as a collective and still has own significance in showing leading light to the toiling mass of India in the age of communalism. Rupam Deb: I am a graduate of Sociology and did post graduation in Himalayan Studies from North Bengal University. I have been connected with rights movements in North Bengal including tea workers movement and presently working as an independent researcher. Special thanks to my friend Salim Subba for providing data from the ground and also his academic dissertation for this paper. Salim Subba (2018) Tea Plantation Labour Movement in Darjeeling Hills (1856-1955); Its Genesis and Growth, [Unpublished M.Phil Dissertation], Department of History, Darjeeling, N.B.U.